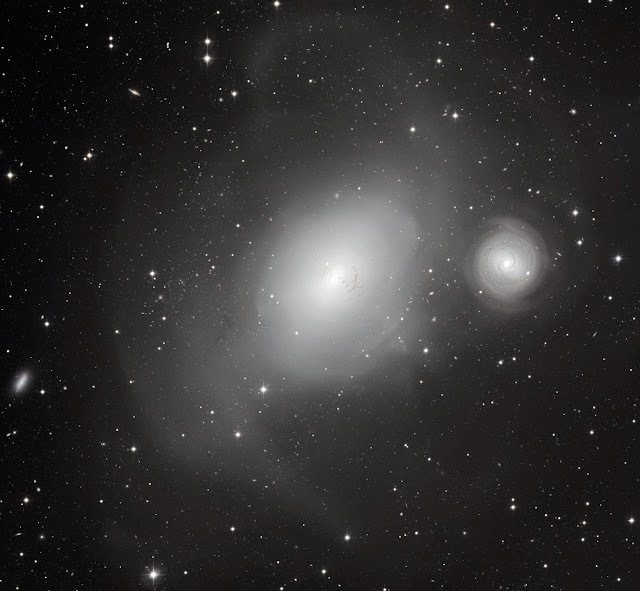 In the Fornax constellation, there are two galaxies that are close to one another; NGC 1316 and NGC 1317. These two are quite close to one another but have two opposing histories. NGC 1317 has a quiet and silent past while NGC 1316 is a turbulent one. NGC 1316 which is about 60 million light years away from Earth, has shown signs that is has eaten up and swallowed other galaxies in the past and may be still doing it up to now. Faint dust trails and tidal tails left over from its feast surround the galaxy giving evidence of its violent background. The image captured by the European Southern Observatory's MPG/ESO 2.2-metre telescope shows the two galaxies in close proximity to each other. The small spiral NGC 1317 has led an uneventful life, but NGC 1316 has engulfed several other galaxies in its violent history and shows the battle scars. Several clues in the structure of NGC 1316 reveal that its past was turbulent. For instance, it has some unusual dust lanes embedded within a much larger envelope of stars, and a population of unusually small globular star clusters. These suggest that it may have already swallowed a dust-rich spiral galaxy about three billion years ago. Also seen around the galaxy are very faint tidal tails — wisps and shells of stars that have been torn from their original locations and flung into intergalactic space. These features are produced by complex gravitational effects on the orbits of stars when another galaxy comes too close. All of these signs point to a violent past during which NGC 1316 annexed other galaxies and suggest that the disruptive behaviour is continuing. NGC 1316 is located about 60 million light-years away from Earth in the southern constellation of Fornax (The Furnace). It also bears the name Fornax A, reflecting the fact that it is the brightest source of radio emission in the constellation — and in fact the fourth brightest radio source in the entire sky. This radio emission is driven by material falling into the supermassive black hole at the centre of the galaxy and has probably been provided with extra fuel by the interactions with other galaxies. This very detailed new image from the MPG/ESO 2.2-metre telescope at ESO’s La Silla Observatory in Chile was created by combining many individual images in the ESO archive. The aim of the original observations was to reveal the faintest features and study the disruption of this interesting system.